Are you planning to add a deck to your home? Or perhaps you’d like to build a few hardscape features out in your yard – like a built-in bench, an arbor, or planter boxes for container gardening. 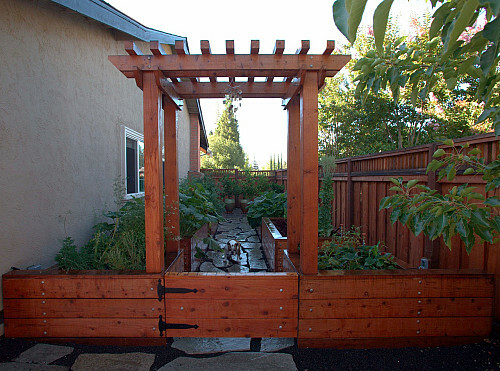 When you select a construction material, remember California redwood is a natural choice for your outdoor project. Find out why, in this Networx interview with Charlie Jourdain, redwood expert and manager of market development for Mendocino Forest Products. Is California redwood a sustainable product? Redwood grows only along the Pacific coast of the USA, from California up through southern Oregon. Mendocino Forest Products and its sister company, Humboldt Redwood, are the largest manufacturers and distributers of redwood products. The 440,000 acres of forestland which we own are all sustainably managed for the production of redwood and Douglas fir lumber and certified by the FSC (Forest Stewardship Council). Most people think of California redwood as giant, old-growth trees, but it’s been over a decade since we harvested those. All the old-growth redwood forests are now preserved as federal parklands. What we manage is second-growth forests of younger trees and we actually grow more timber annually than we harvest. In addition to the timber production, we also sustain all other forest-related attributes such as soil quality, water quality, and wildlife. What are some advantages of building with redwood? 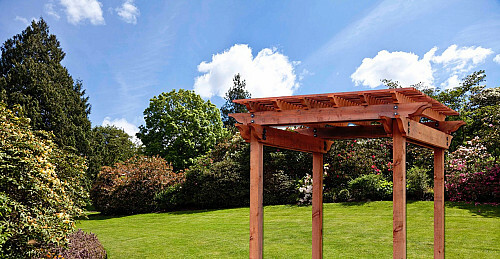 Redwood is remarkable for its natural durability. You can use it for any outdoor carpentry project where it’s fully exposed to weather, like a garden shed or a pergola, as well as exterior decking and fencing. It doesn’t have to be chemically treated since it’s naturally resistant to decay and insects. Contrast this with non-durable wood species, whose lifespan is only a handful of years if you don’t apply a preservative, whereas redwood can last 2 or 3 decades. Redwood is also beautiful – a very attractive color and grain structure. Its relatively light weight, combined with strength and stability, make it easy to work with. Whether you’re cutting, sawing, inserting screws, or performing any other kind of machining task, redwood handles nicely. Due to its open grain structure, redwood will hold a finish better than most other woods, for improved appearance and durability over time. If left unfinished, it will eventually turn driftwood gray, but it will still hold up very well. How much maintenance does redwood require? 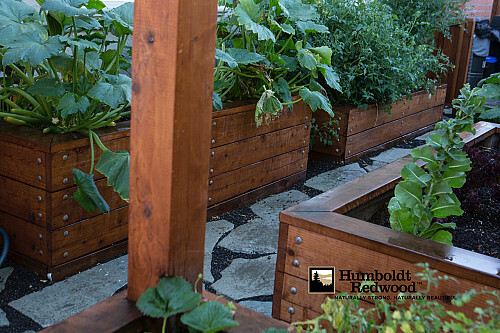 Redwood outdoors will be exposed to dust, leaves, pollen, bird droppings, perhaps grease from your barbecue, and so on. Clean the wood occasionally with water, adding an eco-friendly product like Simple Green if it is very soiled. Usually cleaning once or twice a year and refinishing with stain or paint every 2-3 years is ideal for something like a porch or gazebo. A picnic table should be cleaned and oiled annually, before the outdoor entertaining season begins. How does redwood compare to other hardscape building materials? Cedar, commonly used for outdoor projects, is not a US-grown product like California redwood, as it often comes from Canada. It’s also frequently harvested from old-growth forests. Tropical hardwoods from Central and South America, or Indonesia may be marketed as sustainably forested and harvested, but there is a lot of skepticism around these claims . Although Southern yellow pine is a nice species, mostly sustainably grown, it does need to be chemically pressure treated, raising health concerns, especially if you utilize it for container gardening of vegetables. (Redwood, on the other hand, can be used for planter boxes with no worries). Other products like plastics or plastic composites may claim to have some recycled content; however, many of the higher-performance plastic products don’t incorporate much recycled material. They’re also quite expensive, heavy, and hard to work with. In the summertime, walking on a plastic deck can be very hot and unpleasant underfoot. Besides, a lot of people are surrounded by plastic all day long at work. 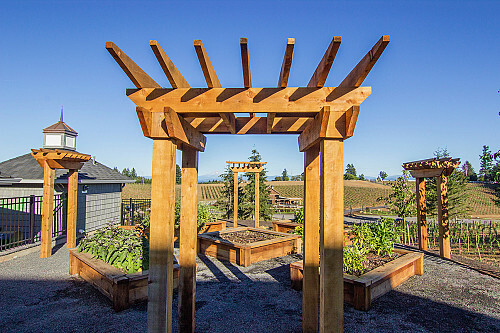 When they come home and sit down on their deck to relax, they want to be surrounded by a more natural environment, with naturally durable and sustainable products like redwood lumber.